Dan appeared on Good Morning America, Wednesday, May 21st to discuss the current controversy happening in the National Football League. Hundreds of players are alleging that they were given painkilling drugs illegally and that the league put profits ahead of their health. 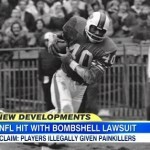 Many big name players might be suing the league alleging that they were given these drug to numb their injuries so they could return to the playing field more quickly and thus giving them lifelong medical problems. The NFL is saying that it is too early to comment but is already paying thousands to resolve another suit involving concussions. Says Dan, “This one is theoretically more dangerous to the league, than the concussion case because it could encompass a lot more retired players. You’re talking about the possibility of anybody prescribed as little as an aspirin, being part of this class of people. That’s what makes this a tough case. This is a compelling argument that they put forward. Meaning, they talk about individuals and their suffering, et cetera. But that’s a public policy argument. It’s going to be a lot tougher legally, I think, in this case.” Watch the entire clip here.